Doug has been building and designing fine cabinetry and furniture since he began his career as a master cabinetmaker’s apprentice in the late seventies. In 1983 Doug founded Exclusive Woodworking with his brother John to manufacture architectural millwork and custom cabinetry for discerning professionals in the architecture, interior design and construction communities. In 1989 Doug and John founded nuHaus to focus on design. 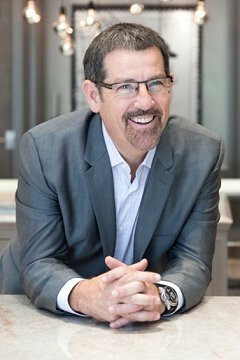 Doug leads the nuHaus design team and is the recipient of many awards from the prestigious Sub-Zero and Wolf Kitchen Design Contest and since 2009 now serves as a judge for the contest. Doug’s expertise has been featured on local Chicago radio and television and nuHaus’ work is widely featured in regional and national publications. As a leader in the industry, Doug was commissioned by Bosch and Siemens Hausgerate (B/S/H) of Munich, Germany to design and build their premier display featuring the Thermador product line, which can be seen at the Abt Electronics and Appliance showroom in Glenview, Illinois. Additionally, Doug confers with Sub-Zero and Wolf Appliance Corporation on new product design and prototype development and was invited by Sub-Zero to showcase his design work integrating their products at their Midwest “Living Kitchen” in Glendale Heights, Illinois, the Merchandise Mart in Chicago and most recently at their new Buckhead showroom in Atlanta, GA.
Doug is actively involved in Lambs Farm, a not for profit organization located in Libertyville IL where his younger brother Tom, resides. Lambs Farm is dedicated to improving the lives of developmentally disabled adults, and Doug serves on the board for their annual golf outing. Doug and his wife Judy enjoy riding motorcycles, golf, fitness and spending time with family and friends.